We invite you to join us for three days of Argentine Tango. Whether you are an experienced dancer, or this will be your first time learning tango, if you are curious about this beautiful art form this will be the place to be. Even if you’ve never given much thought to dancing this event will offer enjoyment for everyone. Not to be missed! It is a rare opportunity to spend three days learning from a Master (Maestro) dancer, teacher and performer of worldwide acclaim. We are all looking forward to welcoming our special guest instructor, Marcelo El Chino Gutierrez to Baltimore. He will be with us throughout the weekend to teach workshops, share his knowledge of tango and to join us in the excitement of dancing Argentine Tango right here in Baltimore. The Grey Matter Art Space becomes perfect tango venue for the night of Friday, April 5th with its expansive high ceilings, hardwood floors and artistic ambiance. The evening starts off with classes geared for new dancers, followed by a workshop on the Tango embrace. Grey Matter Milonga follows with social dancing into the night. Join in Saturday's workshops and explore Tango as an experienced dancer or a beginner at Function. In the evening, Function hosts Lux Milonga in the gallery for an inspired night of dancing on professional sprung hardwood floors. The popular dance event known for its lively vibe will explore classic tango and new sounds in the intriguing contemporary space from 9:30 PM until 1:00 AM. On Sunday, learning continues with Maestro Marcelo leading a new lineup of classes, and a presentation on the history of tango. The Inner Space Finale Milonga tops off the weekend, featuring live music from Washington’s sensational Da Capo Tango with guest musician and recording artist Bob Barnes, rocking the house on bandoneon. It is the first Baltimore appearance for Da Capo Tango and Maestro Marcelo Gutierrez. Maestro Marcelo Gutierrez is a world renowned tango master and performer. Marcelo won 2nd place in the 2002 Tango Salon Championships in Buenos Aires and he advanced to finalist in the Tango World Championships in 2017 in Buenos Aires. He incorporates principles from physics, neuroscience, and psychology to challenge himself and the limits of tango. He offers his students the fruits of these experiences and his passion to keep tango evolving. You don't want to miss this unique opportunity to connect, embrace, enjoy and learn from Maestro Marcelo Gutierrez. Admission to Friday events is advance purchase or RSVP only. Grey Matter Art Space is the private residence of working artist David Herman. In respect to the artist’s hospitality and to avoid inconvenience, attendance will be confirmed via online ticket purchase or RSVP only). 9:30 PM – 1:00 AM Lux Milonga at Function hosted by Argentine Tango Space Project with DJ David Richardson. 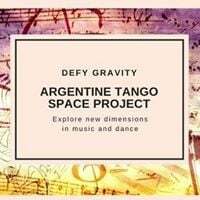 6:30 PM to 9:30 PM Inner Space Finale Milonga at Function with LIVE MUSIC by Da Capo Tango featuring Minneapolis-based composer, arranger, and recording artist Bob Barnes. Individual classes with instructor Marcelo Gutirrez. The History of Tango: A Presentation by Maestro Marcelo Gutierrez $12. After 3/31/19, $12 (no price change) The Lecture/Talk is not included in package rates and must be purchased separately. Friday Milonga–Grey Matter Milonga at Grey Matter Art Space $18. After 3/31/19, General Price $20 - Tickets for this milonga must be purchased in advance. Admission to Friday’s activities hosted at Grey Matter Art Space are by RSVP or advance ticket purchase only. (Grey Matter Art Space is the private residence of working artist David Herman. In respect to the artist’s hospitality and to avoid inconvenience, attendance will be confirmed via online ticket purchase or RSVP only).